Water is crucial in any bird-friendly backyard, but not all water is equally friendly to birds. 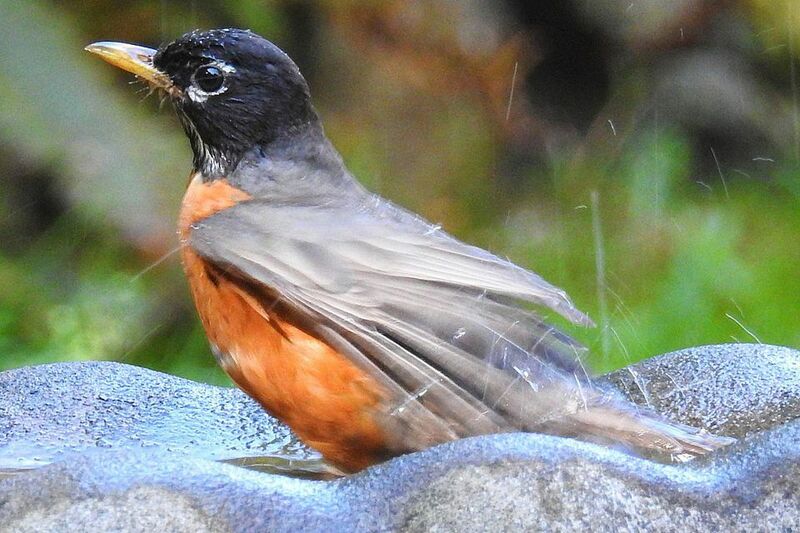 While there are many ways bird baths can be dangerous to birds, many common problems are easily fixed and both birds and birders can continue to enjoy the advantages of appropriate backyard water sources. With regular, gentle care (daily or weekly as needed) any birdbath can be a fantastic backyard feature and many different birds will appreciate the reliable water. Birds need water not only to drink and stay hydrated, but also to bathe, preen, and keep cool. A backyard bath can be especially important in arid regions where natural water sources are unpredictable and during periods of extreme drought when even long-standing water sources may vanish. Bird baths are also essential during the winter when much of the natural water is frozen. Birds need to conserve energy for body warmth and without a water source they spend that energy melting frozen water. While a birdbath is helpful, if it's not suitable, it can actually cause more problems for birds. There are many ways a bird bath can be problematic, but there are also steps you can take to fix the issues. If there is no water in the bath, it doesn't do any good for the birds. Even a deeper bath may empty out quickly from the vigorous splashing of bathing birds or evaporation on hot days. Shallow baths will dry out more quickly than deeper basins. The Fix: Opt for a slightly deeper bath and position it properly to stay full longer, taking advantage of sprinklers, water downspouts, or other refilling options. A deeper bath will stay full longer, but a very deep basin is not suitable for smaller birds. It may actually present a drowning risk if birds tumble into the water. Also, if the water level in a deeper bath drops, birds may not be able to reach the water from the basin's edge. The Fix: Add several large stones to the basin to create a shallower area where smaller birds can access the water. You can also place a few sticks in the bath to create accessible perches. Birds are not always fussy about their water sources, but a dirty bath contaminated with discarded seed hulls, shed feathers, feces, algae, and other debris can be a breeding ground for harmful bacteria and insects. This can result in the water being the cause of diseases that can spread to all the birds that visit. The Fix: Clean the bird bath regularly with a weak bleach solution and rinse it daily to minimize contamination. It is even possible to clean a bird bath without scrubbing! Hanging baths can be very useful and are a welcome water source for birds. They can also be unstable and may spill or splash as they swing. If they can't feel secure while they visit, many birds will avoid a hanging bath, no matter how thirsty they may be. The Fix: Choose a hanging bath that is large and heavy enough to stay stable when birds land on it. Hang the bath in an area away from breezes that could cause additional swinging. Birds aren't the only wildlife to visit bird baths. Predators like feral cats and different raptors will quickly learn to stalk a bird bath for an easy feathered meal. Birds are more vulnerable when drinking and bathing and can be easy prey for savvy predators. The Fix: Position a bird bath so it is close to an adequate shelter where threatened birds can retreat. Avoid placing a bath directly in the shrubbery, since that could conceal hunting predators. When a bath freezes in winter, the water is inaccessible, and ice buildup can damage delicate finishes or crack concrete bird baths. Birds then need to use additional energy to melt snow or ice for drinking. This is energy they need for body heat to survive cold winters. The Fix: Use a heated bird bath from late fall to early spring to avoid any risk of frozen water. Alternatively, add an outdoor heating element to an existing bath to keep the water in a liquid state. Metal bird baths can be attractive and durable, but they can also become excruciatingly hot in the summer sun. In extreme cases, hot metal can cause burns. Warmer water is also less appealing to birds and is more likely to become a breeding ground for algae and bacteria. The Fix: Avoid using a bird bath with a metal basin. If you already have one, position it in a thickly shaded area where it will stay cooler throughout the day. A small birdbath will not only dry out quickly, but it does not provide adequate room for multiple birds to drink simultaneously. It also may not be deep enough for birds to bathe, making the bath less useful for backyard birds. The Fix: Choose a bath with a larger, deeper basin, or group several tiny bird baths together to create an impromptu water feature that will meet more birds' needs. While birds will drink from any source of water, a still, stagnant bird bath is less attractive and more likely to harbor dangerous bacteria. A still bird bath may also not be noticed by passing birds that would likely visit a water source, even if they won't visit feeders. The Fix: Add a dripper, mister or wiggler to the water to create ripples and splashes that will attract birds' attention and keep the water moving or try a birdbath fountain. A bird bath might appear fresh, clean, and otherwise ideal for birds, but could still be hazardous if it becomes contaminated by pesticides, herbicides, fertilizers, or other backyard chemicals. These chemicals can be toxic and fatal to birds, even in small doses. Additionally, it's tempting to want to paint a metal bird bath and if it's not sealed properly, this may poison the birds. The Fix: Minimize backyard chemical use and always cover bird baths when chemicals must be sprayed. Clean bird baths regularly to remove any lingering toxic residue. If you paint a bird bath, do not cover the inner bowl with paint or use an animal-friendly waterproof sealer.